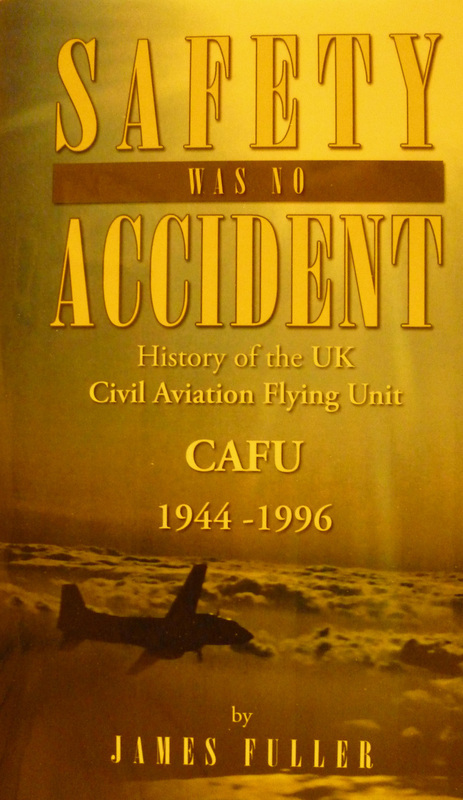 This site is a sample of the book I have self-published about the history of CAFU, 1944 - 96, "Safety was no Accident". It is not the complete work, but gives small tasters of what I discovered and the photographs donated. Charles Marchant, ex CAFU Superintendent, kindly wrote the Forward, and I was able to use Captain Geoff Gurr's self-published biography, A Testing time', (the CAFU section part written by ex Navigator and pilot Sidney Pritchard). Now that my book is published, returning visitors will realise I have deleted some information in the hope that those interested might wish to purchase it (best found through Amazon). Certainly, I am grateful to all those who assisted me with anecdotes and corrections. .During 2018, Gary Morton and his brother Ian have bought the cockpit of G-ANAP, with the intention of restoring it to its former glory. It was in an horrendous condition, but Gary, and his brother Ian, who hass has done most of the hard work, Gary says , have really progressed. They have also obtained much paperwork on its CoA heritage. Gary asks if anyone knows if this aircraft had Decca installed? Give him an email if you have any recollection at <garysmorton@gmail.com>. In time, perhaps you might find a few photos of his work in the 'Aircraft' ​section which can be found under 'More'. In the late 1960s a TTO at Birmingham airport knew that the flight inspection aircraft was due. One day on the early morning rounds he recorded all the parameters for the recently installed ILS glideslope transmitter as usual. Then he set all the controls to zero and commenced to follow the handbook in setting the system up again from scratch. Once this exercise had been completed he checked that the parameters recorded earlier were replicated. Satisfied he left to assume his duties in the control room as usual. The airport closed each night and each morning a freight aircraft arrived as soon as the place reopened. In conversation one day the pilot had chanced to meet the TTO and mentioned that he thought he had seen the glideslope flag disappear long before it should have, however the pilot had ignored it as it almost immediately reappeared so he continued and landed. In due course CAFU arrived, flew the ILS as per the book and, satisfied, landed for lunch. Chatting over lunch the TTO mentioned to the inspector the story of the disappearance of the glideslope flag. Concerned, the inspector and the aircrew took off again and re-flew the ILS looking for a signal that would cause the flag to deflect. They found it together with a false glideslope at a degree and a half which would have put the aircraft down half a mile before the runway touch down point. The setting up instructions in the book turned out to be in need of amendment. This done there was no recurrence of a false glideslope. CAFU used to be particularly rigorous in the checking of this glideslope as it had a kink in it caused by the proximity of a hangar to the touchdown point. This was a known anomaly and presented little in the way of surprises to regulars who flew into Birmingham. The TTO went on to become an inspector. Today the runway is longer, the touchdown point has moved and the hangar has gone — as have CAFU. It was a municipal airport in the long ago where an ILS of ancient mien was replaced with a new transistorised one. The runway had been extended using the slums of the local city as a base, the markings applied, the over-run grassed and the new Localiser aerial erected. Far away in the equipment room, full of technical paraphernalia, rest area and galley kitchen, in the control tower and next to the cocktail bar of the passenger lounge, was installed the monitoring and control units of the ILS. The system had been checked on the ground, in the air by CAFU and accepted. All worked well, all was well — but only when aircraft landed going in the right direction. It was soon noted that so long as the aeroplanes landed and departed from right to left peace reigned down in the equipment room. However, on the odd occasions aircraft had to land from left to right (and as it happens — uphill) and the wind was somewhat high, the incoming Viscounts caused the ILS Localiser main transmitter to firstly trip to the standby transmitter and then to shut down. This occasioned loud noises from the control units and a degree of blasphemy from whosoever was in charge of the equipment room. The cause was that just before the threshold of the runway the radio reflections from the ILS transmitter aerial bounced off the underside of the Viscounts and was picked up by the monitoring aerials in front of the localiser aerial. Viscount aircraft in these conditions landed in an elegant manner, to whit, slowly; they lingered over the monitor aerials. The monitors thought that all was not well and swapped transmitters and then quit. In the event of Viscount No 1 being followed by his relative, Viscount No 2, also flying the back beam of the ILS, this was an embarrassment. So he who cursed in the equipment room had to reset the system swiftly knowing that it would probably happen again, and again, and again until the wind changed. It became routine. In the summer the wind tended to blow the proper way and Their Airships the Viscounts landed from right to left. However it became apparent that all was not well in the ILS department as there were instances of the ILS swapping to the standby transmitter without the assistance of an aircraft overhead. Gremlins were suspected and the Avo 7 and spanner gang of Reg and Charlie (who were knowledgeable in these matters and game to expose themselves to the vagaries of the weather at the runway’s end) investigated not once but many times in the course of several weeks. Eventually someone in the tower noticed that the arrival of crows in the restricted area of the monitor aerials coincided with the alarming noises in the control room. Many binoculars were brought into play and it was observed that the crows liked the monitor aerials whereon to do their daily feather pulling and ablutions. Black feathered gremlins had to be discouraged, but how (and what believers would exist in Tels HQ in London?). Research and evidence from that research was of paramount importance. It was postulated that a landing crow configured in touchdown mode, undercarriage half down and wings at seven eighths extension one foot above the aerial mimicked a Viscount forty feet overhead. As the crows would not willingly co-operate they had to be modeled in a series of air breaking ingenious experiments. The crows part, was taken by a chicken, albeit a non-operational chicken of uncertain parentage without plumage. It’s aeronautical ballet was conducted on the end of a fishing line suspended from a glass-fibre fishing rod of gigantic proportions. Simulating the approach and departure of a crow it was soon shown beyond argument that a mass of aeronautical flesh (frozen but slowly thawing) was indeed able to so affect the monitors as to produce the irritating symptoms described above. The acquired data resulted in the addition of vertical hardboard triangles being attached to the monitor’s horizontal aerial ends thus reducing the area above the crows intended perch to less than the seven eights wing extension of said birds and thus inhibiting their ability to land. The equipment room became a restful place once more. I regret to say that whatever report went to Tels HQ, the original research data and the practical outcome did not result in a doctorate or a trip to the Palace for either Reg or Charlie. The participating chicken was written off. Its final resting place has not been recorded although rumour had it that the intrepid duo fared well for supper in the days that followed. CAFU Civil Aviation Flying Unit. Viscount Vickers, four engine turboprop airliner of the sixties. Frank Martin, who I remember from the sixties who worked in Tels and was the Commanding Officer of an Air Training Corp. Gliding school in the Essex area. Also, Les Weidman, who worked at the Hanger, father of Rose Weidman, who worked in the CAFU photographic section before going to ATEL. Rose's friend, Dawn Monk, who was secretary for one, if not all, of the Deputy Commanders in the 70's, before going to work at the Stansted Tower. Penny Hutchins, secretary to the Commander, Geoff Gurr. Louis Temple who worked in Admin, her husband was also an EO in Admin (what was his name, Alan, perhaps?). Elaine Banks, who at one time worked for Bill Aitkin. Two gentlemen who worked opposite Ops in the Technical records office — Ron Edwards and ? - good lunchtime cribbage players, I recall. John Martin, who worked in the Calsibration section within Tels in 1963 and later went to Eurocontrol. John reminded me of more names: Bob Phillips, Bud Abbott, Ray Ross, Alan Waters, who all worked somewhere in the depths of Tels. John also remembered going to Jimmy Richardson's retirement. Graham Talbot, Tels, told me it was John Roberts in one of the photographs and also explained much of the equipment shown - thanks, Graham. At least one pilot who's name I forgot was Tony Clark, HS125 pilot who took me to Malta with Tony Lister. When we left our hotel for the airport I noticed a man running out of the hotel waving (shaking) his hand at us, which we thought very friendly. On return, when I went into the Ops room at Stansted, there was a teleprinter message saying that one of the guests (me) at the hotel in Malta had failed to pay for his room! The next day, Monday, I had my bank send a bankers draft to the hotel. The hotel manager sent another Teleprinter message saying, "Only the British would be so honest"! KEEP SENDING YOUR MEMORIES, THEY MAKE TERRIFIC READING.